I walked up to my front door to find that there was a bright red present tied with white and blue ribbon waiting at its feet. It felt as if I had just received my first valentine card…the excitement, the joy, the intrigue. Ripping through the wrapping, I found myself faced with a metal madeleine tray with 12 scallop-shell shaped moulds staring up at me. Now if like me, you’re a food obsessive, you’d know what to do with it – otherwise you’d be taking it down the beach to decorate your sandcastles with. But I still hadn’t figured out who left it there! The card that accompanied the tray made everything clearer; it was a gift from my friend, Pie. 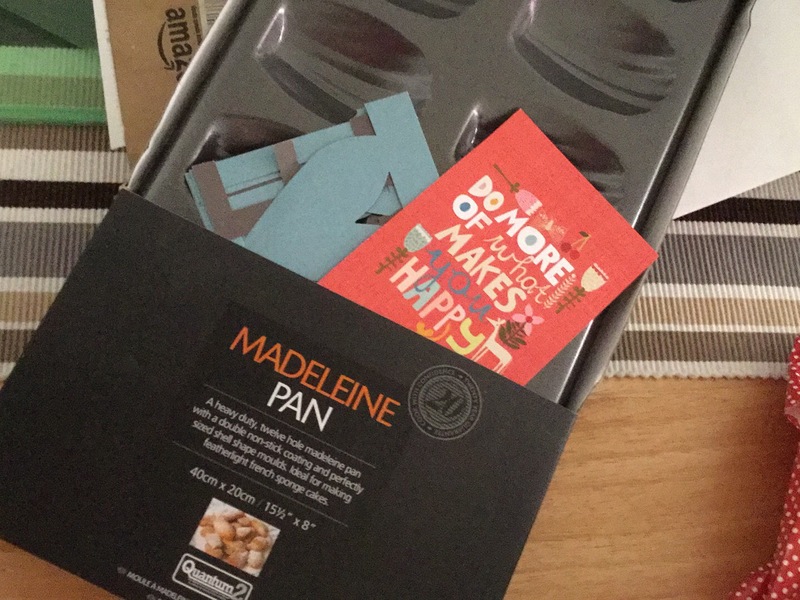 On the card were suggestions as to which madeleine recipe to follow and who to youtube should I need direction, so that I too could enjoy the delights of a fresh, warm madeleine with a cup of coffee as a weekend breakfast. So what is a madeleine? A madeleine is a French patisserie favourite. A small, buttery sponge cake to enjoy with a cup of tea or coffee. Classically they will either be lemon or almond flavoured, however, they now come in a variety of different flavours; dunked in chocolate or filled with jam/fruit/curd. But what sets a Madeleine apart from a standard sliced tea-time sponge cake, is the scallop-shell impressed pan they are baked in. 1st: Preheat the oven to 200˚C. Brush the Madeleine tray with melted butter, shake in a little flour to coat the shells and tap out the excess. 2nd: Prepare your dry ingredients in a bowl and the lemon zest. Pour the lemon juice into the melted butter and set aside. 3rd: Whisk together the eggs and the sugar in a bowl until frothy. 4th: Pour in the melted butter and lemon mixture and lightly whisk in the flour. Leave to stand for 20mins before carefully pouring the batter into your prepared madeleine tray. 5th: Bake for 8-10mins until risen in the middle and fully cooked through. The madeleine should be golden brown around the edges. 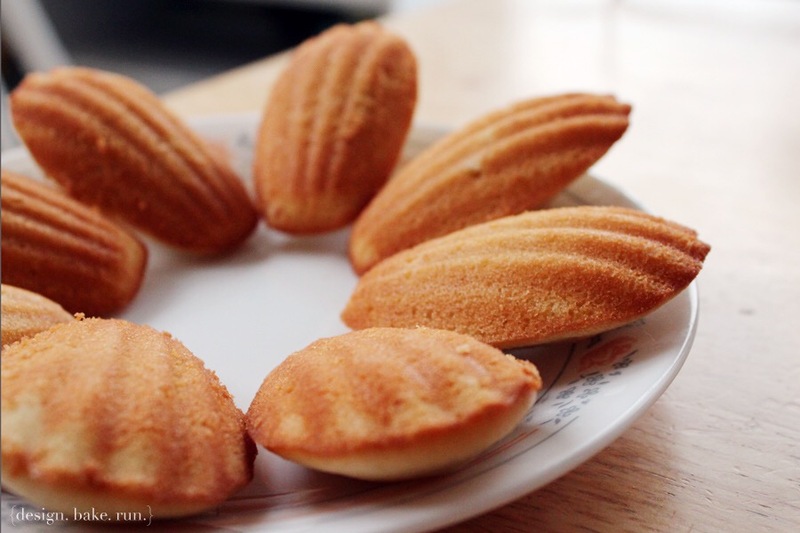 Transfer the madeleines to a wire rack and leave for a few minutes to cool slightly. Madeleines are best eaten within the hour – barely warm and sprinkled with icing sugar. I recommend you set your timer for 8mins and then watch the madeleines like a hawk as they’ll go from pale and white to dark brown within the 2mins left! Renowned food writers, such as David Lebovitz, who is known to “pop a few for breakfast” drizzles honey into the mix and gives his batter a generous wait time. Rachel Khoo, from Little Paris Kitchen, drizzles in some honey and prods a raspberry into the centre of the batter mixture before baking, then piping lemon curd into the centre of the baked madeleine. Julia Child’s recipe calls for salt, vanilla extract, 2 drops of lemon juice and 2 drops of bergamot extract as well as boiling the butter first to turn it brown – why would any home cook want to have to go through all that?! I followed Michel Roux Jnr’s recipe adding more lemon juice than expressed. Next time I’d like the madeleine to have a stronger lemon taste therefore adding more juice or perhaps adding some lemon curd to the batter mixture. I prepared the batter before I went out the night before and placed in the fridge. Make sure not to fill the moulds too much as they will spill over and engulf the madeleine next to it if you’re not too careful. I suppose, like the old Chinese proverb: give a man a fish and you feed him for a day. Teach him to fish and you feed him for a lifetime. Pie has provided me with the tools and wisdom, so that I too can eat madeleines as often as I want.